Homer : Odysseus Survives a Shipwreck, circa 800 B.C. W. W. Norton and Company Inc., New York, 1967, 1974. Chapter 5: Verses 365 to 463 (pages 74 to 77). While most writing about surfriding focuses almost exclusively of the thrill and/or the art of wave riding, other skills are essential to achieve such a performance in what is esentially a highly dangerous activity. In extreme surf conditions the return to shore, which may appear to be the most simple of procedures to the uninitiared, can be fraught with difficulties. Some of these difficulties are illustrated by Homer in the earliest written report of a shipwreck from ancient times. Odysseus survives the destruction of his raft by a great wave, then swims for three days before negotiating the surf zone with considerable difficulty and safely returns to shore in the land of the Phaeacians. The edited text below basically excludes the role of several Greek gods and their interactions with Odysseus during the ordeal. In an extended account following his arrival on shore (Lines 465 to 493 and not included here) Odysseus is aware of the potential of death due to hypothermia and sensibly chooses to spend the night inland under cover rather than remaining exposed to the elements on the beach. The account is so remarkably rich in realistic detail it is hard to imagine that the author has not had some personal experience of such a near-drowning event. Odysseus' difficulties in negotiating the surf zone to return to shore parrallel the experiences of some surfriders up to the universal adoption of the leg rope, circa 1976. Before then, surfboard riders who were separated from their boards in a wipe-out had to swim and bodysurf back to the beach to retrieve their boards. A terrible disastrous one, overarching; it dashed him. Bestrode one spar as if he were riding a horse. And he stretched the veil right away beneath his chest. He wandered, and his heart many times saw destruction ahead. Scanning sharply, as he raised himself from the great wave. 398 So delightful did land and forest appear to Odysseus. 400 Vigorously he swam to set foot on the mainland. For the great wave was dashing upon the dry mainland. 410 And no way of escape appears from the hoary sea. Moans as it surges, and the rock runs on up smooth. And hurl me on rough rock, and my trying would be in vain. For I know how angry the renowned earth-shaker is at me." 425 Till a great wave bore him up on the rugged shore. 430 And held onto it moaning, till a great wave came along. And dashed on him and threw him far into the ocean. Was stripped off. And the great wave covered him over. If bright-eyed Athene had not given him presence of mind. On spits of land jutting out and harbors of the sea. Of a fair-flowing river (7), there the best place seemed to him to be. It was bare of rocks, and it had a shelter from the wind. 451 ... At once the river stopped flowing and held the wave. And his stout hands. For his own heart was downed by salt water. He lay with slight strength, and dread fatigue came upon him. Lay down on a rush bed, and kissed the grain-giving earth. 5. Poseidon is fabled to ride a horse chariot through the waves. 6. A goddess of the sea. 7. The rivers are gods in Homer. 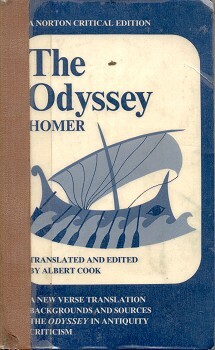 Geoff Cater (2008) : Homer : The Odyssey, circa 800 B. C.